I discovered this book through a fellow librarian at work, who not only recommended the series, but specifically the audio version. When she said it was swashbuckling adventure during the Napoleonic wars, I wasn't too interested. That is, until she said, "with dragons." Then I was intrigued, and since I've come to trust her taste in books (she is, after all, a Miles Vorkosigan fan), I picked up the first book of the series and started listening. The premise is that the air corps of the military forces in the world are made up of different breeds of dragons. Each breed has different strengths and advantages, and each dragon must be "harnessed" by a partner shortly after hatching, or it will not be socialized and trainable. Laurence, a captain of a British sailing ship, captures a French ship, and on board the captured vessel, they discover a dragon egg. It is an amazing prize, but there's just one hitch: the dragon egg is perilously close to hatching, and they are days from shore. One of the ship's officers must attempt to harness the baby dragon, or they risk losing it to the wild, which would be a grievous loss, as every able-bodied dragon is sorely needed to help defend the country against Napoleon. They draw straws, and Laurence includes himself among the officers, because he is an honorable man. None of them wants to be part of the Aeriel Corps - those men who live separately, perforce, from society. Laurence and his officers are seamen, with lives on land, aspirations in the Navy. Laurence is privately embarrassed by his own relief when he is not chosen, although he can see what a poor choice the lad with the short straw is - he's terribly afraid of heights, but he tries, when the time comes, to harness the creature. However, as Laurence is soon to learn, when dragons are concerned, it's best to expect the unexpected. Laurence's life is turned upside down when the little dragon approaches him, and the dismay he initially feels at the consequences - losing his place in society, his pretty fiancee, his naval career - quickly dissipates as he comes to realize that harnessing the young dragon, Temeraire, is the finest thing that could ever have possibly happened to him. This first book in the series follows Laurence and Temeraire as they explore their new world together and try to find a place for themselves in the Aeriel Corps. Temeraire is an unusual dragon - his breed is unlike any other in the Corps, and Laurence, as a sea captain, is an unusual dragon rider. But together they make an excellent team, and the development of their relationship as the book progressed was my favorite aspect of the book. I have seen this book compared with Jane Austen's novels, and it seems an odd comparison for a fantasy novel set during wartime. Yet it is an applicable comparison, especially in the dialogue of the book, as much is conveyed with few words, and what remains unsaid is nearly as important as what is spoken aloud. The audio version is a treat! 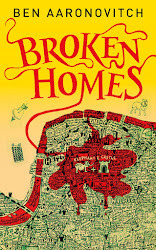 Simon Vance is such an effective narrator that I found myself forgetting that it was a single person telling the story - it seemed like a host of characters, each with a distinct voice. I particularly enjoyed Temeraire's voice - Vance uses the perfect expression and intonation for his speech. I was a tad reluctant to read the book initially, because of the love I bear Anne McCaffrey's Pern books, and the fact that most other dragon novels (particularly those about riders bonding with dragons) simply do not hold a candle to the amazing world she created in those novels. 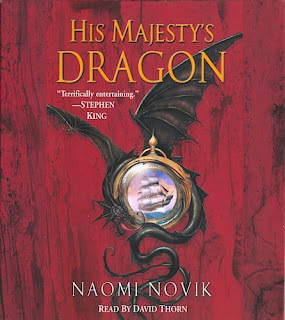 I need not have worried - Novik's world is so very different, as are the dragons and their relationships with humans, and it quickly became an entirely separate thing, set as it is in a world that is in every respect realistic to its time period (except, of course, for the dragons). This was a truly delightful novel, with excellent characterization, tight writing, and effective world building. I am so pleased that there are many more books in the series that have already been published, and I intend to listen to the audio version of all of them. I highly recommend this one! All Booked Up: "...there's a bit of everything, from battle, to society, to politics and beyond. The pacing seems to be well done, and this is a book where all the positive hype on LibraryThing and elsewhere seems to be correct." Mikko Reads: "This is perfect entertainment: light and quick to read, but also funny, smart and touching. The main characters in the book are particularly charming." My Life as Seen Through Books: "I found this book to be a creative and fun read, and the relationship between the dragons and their "handlers" is nothing short of sweet. I mean, who wouldn't want their very own dragon, especially one that's strong, powerful, intelligent, and wholly devoted to you?" Reading Adventures: "Overall, a very enjoyable read." I enjoyed the anthology On the Prowl, and I also like Kim Harrison's books, so when I saw this book on the shelves at my library, I thought I'd give it a try. Tanya Huff's story "Music Hath Charms" opens the anthology, and I enjoyed it very much, which was not unexpected, as she's a favorite author of mine. After that, though, the stories were a fairly mixed bunch. I think that it takes a skillful writer to put together a short story in which there is a mandatory romantic element that feels believable and right, while at the same time crafting a well-written fantasy story. At least it feels that way after reading one after the other. Many of them seemed more wish-fulfillment fantasies than actual well-crafted tales. The first three stories of the book were my favorites: Tanya Huff's, as I mentioned, along with "Minotaur in Stone" by Marjorie Liu (an interesting premise and some vivid imagery, but again, I didn't quite buy the abrupt intense love of the two main characters for each other) and "Demon Lover" by Cheyenne McCray (a slightly predicable but intriguing tale of a succubus and one of his victims). Of the others that worked for me, I enjoyed Kim Harrison's story, although it relied a bit too much on a twist that, as I reread it, made me feel as though she'd cheated a bit to pull it off. I also enjoyed "Brother's Keeper" by Lilith Saintcrow, which sets up an intriguing murder mystery in which the victim is the main character's brother. But there's no conclusion to the story - it's as though the author submitted the opening chapter to a novel, and suddenly it all ends. We never even find out whodunnit. It was frustrating, but the character is in such an unusual predicament that I'd certainly pick up the novel to find out what happens! I scrolled through the author's books on Amazon, but I didn't see any featuring Selene, the main character in this story. I saw several series, though - are there any fans out there who'd recommend them? All in all, I am glad I got this from the library. I'd have been disappointed had I shelled out the money to buy it. The Good, the Bad, the Unread: "While all of the stories are well-written and none are truly awful, many of the stories are forgettable or unsatisfying." Janicu's Book Blog: "I feel somewhat disappointed in a lot of the stories in this anthology. In most of them I found too much of the sexual attraction, not enough to make me believe in the relationship." Riley's Reviews: "I will say, this has to be one of the first anthologies in which I genuinely liked every story -- each was a winner for me in its own way." If it were up to me, our house would resemble something from My Family and Other Animals. But I would probably be a single parent at that point - and also I must realistically admit that there are only so many hours in a day, and it's time consuming to take care of the dog and two cats that we already share the house with. 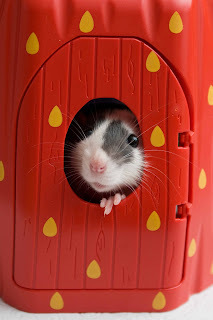 But still, the girls have been clamoring for pets of their "very own" to take care of, and I was lucky enough as a child to be allowed to take care of little critters of my very own (hamsters, mice, parakeets, gerbils) - and it was very rewarding. I also learned a bit about responsibility, and putting another's needs before my own. So (to make a long story short) we caved. Of course, as a librarian, what was I to do but conduct a bit of research about which small animal would best suit our needs? The more I read about rats, how sociable and intelligent they are, the more intrigued I became. I don't remember rats being an option when I was little (of course, I bought all my little critters at Woolworth's, so there wasn't a great selection! ), but I sure would have enjoyed them. 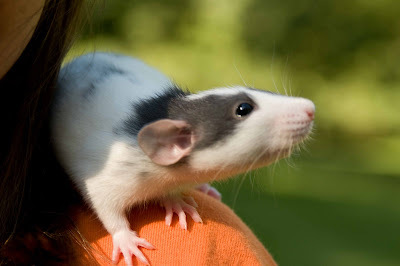 The little girls we have are called "dumbo rats" because of their large, low-set ears. They remind me very much of the Ratatouille rats! They are so much more affectionate than any of the little rodents I had as a child. My hamsters and gerbils put up with me, tolerated my holding them - but these rats actually run up to the cage door when they see us come into the room. When we put out our hands, up our arms they run to our shoulders, and they love hanging out there and checking everything out! We keep a box of bedding nearby, and they are pretty much litter trained, as long as we remember to allow them to access the box every so often. They're inquisitive little explorers, and the kids have been having fun setting up playgrounds for them using boxes and Legos and tubes to connect them (the strawberry house above is part of the Lego set). I had been very concerned about the cats, but they appear only mildly interested, as they obviously have far more important things on their minds. They'll sniff noses with them (more, it appears, to humor us than for any other reason), and then they go on their way. The dog, however, seems to harbor a suspicion that they are squirrels in disguise. And she really, really wants to get them! So we have to be very careful. Joe and Annie, brother and sister, were left by their desperate mother at the workhouse when they were very little. She promised she would soon return for them, but years went by, and she never did. Instead, they are farmed out to a horrible, abusive family who appear bent on working them and starving them until they are too weak to work or eat. The story opens with Annie, the younger of the two, being hit so hard on the head by the enraged "Mistress" that she is knocked unconscious. She and Joe are locked in the shed with the chickens, and Joe realizes that if they don't manage to escape somehow, they will never survive. To complicate matters, Annie is an unusual child - she can see ghosts, and she can channel spirits of the dead, speaking with their voices. Joe is annoyed by this, and although her spirit-voices give useful warnings and advice, and he never seems to believe them except retrospectively. 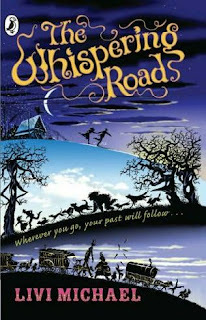 Their desperate flight to Manchester, where they believe their mother went, leads them through the countryside where they encounter a friendly tramp, a bizarre dog-like woman in the forest, and a traveling carnival - and to the city, where Joe encounters incredible poverty and gangs of street urchins, among other inhabitants of the city. Many years before, a farmer and his wife had taken in a young boy and girl from the workhouse to work on the farm. Time passed, yet people noticed that the children didn't seem to get any older. Then a mother came looking for her children, and the horrible truth emerged: The farmer and his wife had been working the children to death and replacing them with similar-looking children from different workhouses. While I enjoyed the book for the most part, I found Joe to be a difficult character to like, and at times I lost sympathy for him altogether and found it difficult to care what happened to him. What further alienated me from the book at those times was that his actions didn't seem fully believable to me. For example, he risks his life to get his sister to safety when they escape the farm. He takes great care of her during the days following, remembering how his mother had exhorted him to take care of Annie. When he later suddenly abandons her - not just leaving her, but taking a coin in return for leaving her, it just didn't make sense to me - it seemed more that the author was controlling his actions to make a point than a natural result of the character's personality and the narrative flow of the book. When I get the sensation that the author is moving characters about like pawns in order to serve her ends, it throws me out of the story. Still, I kept reading - for while I couldn't care too much about Joe, the book was very interesting indeed. I think that children unfamiliar with the conditions that existed back then will be fascinated by this journey into the darker side of Victorian England, and they will come to respect Joe by the end of the book, as I did. This would be a good choice to read with children, or as a child/parent book club pick - there is fodder here for wonderful discussions. A Fort Made of Books: "It isn’t an easy book to read. Joe isn’t an easy hero to sympathize with. Perhaps you will find that the ending repays all your struggle through the middle parts—though the same cannot be said for many of the tragic lives depicted in its pages." 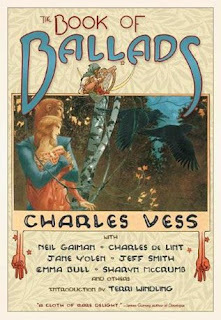 I first heard about this book through Chris and Rhinoa's blogs, and when I read that here are stories inspired by traditional ballads (which I find fascinating and evocative) illustrated by Charles Vess (one of my favorite artists) in graphic novel format (what fun! ), with stories written by many of my favorite writers (Charles de Lint, Neil Gaiman, Jane Yolen, Midori Snyder, Emma Bull) - how could I possibly resist? The fascinating introduction by Terri Windling is not to be missed. Did you know that, if a certain bishop hadn't chanced to rescue an old manuscript that was being used to light a kitchen fire back in 1765, the ballads on that paper would never have been published - the same ballads that were an enormous inspiration to authors such as Coleridge, Keats, Shelley, Southey, Goethe, and Sir Walter Scott? That story, and many more, are told in the introduction. Each ballad of the collection is highlighted in its own separate tale - and these are stories inspired by the ballads, not simply illustrated retellings, so there are lots of fun surprises and interpretations that offer food for thought. 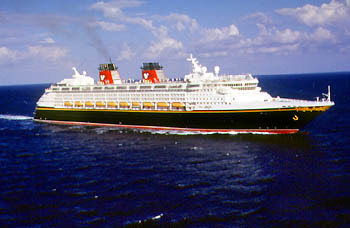 At the end of each story is the text of the version of the ballad that inspired it. Some are funny, many are dark and violent, and in each one the illustrations are perfectly paired with the tone and atmosphere of the story. The only negative thing I can say about this book is that I wish the illustrations could have been in color! Not because the black-and-white artwork isn't effective - it absolutely is - but because I know how gorgeous Vess's work is in color. This wonderful collection is sure to appeal to readers who enjoy graphic novels, folktales and legends, fantasy stories, and ballads. Rhinoa's Ramblings: "Such a stunning collection, highly recommended to anyone with a love of the arts in any form." Stuff as Dreams Are Made On: "a book that I think should be in the collection of any lover of folklore, fairy tales, ballads, myths, legends, and fantasy." 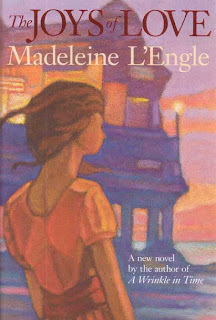 It was a lovely surprise when this book by Madeleine L'Engle, published posthumously, showed up among the new books delivered to my library. It has been sitting on my bookshelf for a long time, not because I didn't want to read it, but because I didn't want to have read it, if you know what I mean. She is one of my favorite writers, and I've read all her books, and it was nice to have this one to look forward to reading for a while. The introduction, written by L'Engle's grand-daughter, tells how L'Engle never managed to publish this manuscript, and it ended up being a sort of special, private book for her two grand-daughters. It is set during the time of L'Engle's life that she spent in the theater, and while it might seem a bit dated to some readers, I found myself enjoying the glimpse of life during World War II - it was an interesting read because it was written during the time it was set, not as a retrospective historical novel - yet it was published so many years afterwards. The story is a fairly simple coming-of-age story (and my library places it in the young adult section, although the editors who originally rejected it felt it was too old for teenagers). It tells the tale of Elizabeth Jerrold, who has just graduated from college, and who, against the wishes of her grumpy guardian Aunt Harriet, has taken a position as an apprentice to a summer theater company at the beach. She is a scholarship student, and Aunt Harriet grudgingly sends Elizabeth $20 a week for her room and board. Elizabeth adores the theater, and she's made some wonderful friends. She doesn't mind the hard work - she gets to the theater early to sell tickets and run errands, and she loves the acting lessons she and her fellow apprentices have in the afternoons. She is having the time of her life - but suddenly Aunt Harriet is determined to put an end to her fun. Elizabeth is smitten with the director, who is obviously attracted to her. Her friends - as well as the reader - can immediately see that she's far too good for him, but of course Elizabeth is going to have to learn that sort of thing on her own. I found him extremely patronizing and irritating - he calls her "little Elizabeth" and "sweet child," and says things like, "I'm very fond of you, funny one." Ick. But he's the important director, handsome and suave, and he is easily able to sweep the intelligent, talented Elizabeth off her feet. Elizabeth experiences an unforgettable summer, meeting famous stage actors, witnessing some of the negative aspects of the theater when spiteful, self-absorbed actors show their true colors, coming to terms with her unusual and sometimes painful past, and learning to trust herself in matters of the heart. I enjoyed the 1940s setting of the book, and the way the characters lived and breathed the theater (some of their conversations reminded me of Pamela Dean's Tam Lin, when the characters got carried away discussing plays), as well as the relationships among Elizabeth and her apprentice friends. I was sad when I closed the book - not only to say goodbye to the characters, but to say a final farewell to the last book by one of my favorite authors that I'll ever get to read for the very first time. I discovered Karen Chance's books last year and have very much enjoyed her unusual blend of action, contemporary fantasy and horror - with a dash of romance. I love the sense of wonder her settings invoke, and the way she weaves historical events with modern times, mythology and legends and combines them with tough, independent, likable heroines. There is a glut of this kind of book in the marketplace these days, so much that I am often reluctant to take the plunge with a new author, but Chance's books stand out from the rest, with their well-developed, unusual characters, plots that are anything but predictable, and her skillful storytelling style. This book is set in the same time and place as the Cassandra Palmer series, and while it features some of the same characters, our heroine is someone new: Dory (Dorina) Basarab, who is an unusual kind of vampire assassin. Born of a human mother and a newly turned vampire father (someone readers of other books will recognize), Dory is a Dhampir. She is human, mostly, but with sensitive, heightened senses and preternatural strength, unusual longevity - and she lives constantly on the brink of insanity, cursed with a berserker kind of rage in which she blanks out, remembers nothing later, but when she comes to is generally covered with blood (other people's) and surrounded by bodies (mostly dead). Vampires fear and hate her - and humans do, too. She lives a solitary life, neither fish nor fowl, and is occasionally called in to "deal with" rogue vampires when needed. Her roomate, Claire, is the one thing she cherishes about her life. Claire (featured in "Buying Trouble," a short story in the collection On the Prowl, which I'd recommend reading before this novel, if possible) is a "psychic null" - her presence nullifies the effect of magic anywhere near her. Aside from being a dear friend, Claire's presence enables Dory to control her rages, to be more human, to be the sort of person she aspires to become. As the novel opens, Dory finds out that Claire has been abducted, might be killed at any moment, and Dory is frantic to find her. But suddenly she is called out to take care of the most psychopathic and demented vampire ever, and if she is to obtain the kind of help she needs to rescue Claire, she must locate and kill the vampire first. Not only that, but she's partnered with the most irritataing, high-handed, nasty-attitude-bearing man she's ever met (another familiar character from the Cassie Palmer books). Dory is tugged back into a world she's been trying to distance herself from, facing creepy, powerful adversaries as well as monsters from her own forgotten past, her loyalties tugged in every direction, on an action-packed roller coaster ride to a wonderfuly explosive conclusion. Along the way she enlists the help of a group of unlikely companions (my favorite of whom is the redoubtable Olga). This was an enjoying whirlwind of a read, exciting, funny, and touching at times, and while I'm excited about the forthcoming publication of Curse the Dawn, the fourth book in the Casandra Palmer series, I'll be looking forward to more books about Claire and Dory. 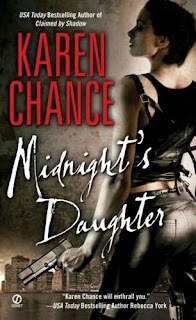 Click here to read Karen Chance's thoughts on Midnight's Daughter. 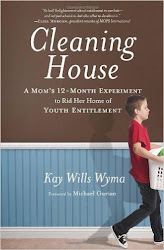 Cherie's Blog: "I obviously adored this first installment into this new series. It not only introduces us to yet another amazing storyline in this supernatural world we have all come to love, but also allows us the opportunity to view the world and its characters in a new light." My Favourite Books: "Karen Chance knows how to spin a pretty involved story with an amusing, wry and flamboyant main character." Reading Angel: "I absolutely love the world that these books are written in. There are lots of fun magical creatures to meet. Dory is one kick=a$$ chick!!!" When Conn decides to pick the pocket of a lame old man wandering through the bad part of town, he has no idea that the object in the man's pocket is a wizard's magical focus stone. Contact with the stone should kill him, but for some reason, it doesn't - and this anomaly interests the wizard, Nevery Flinglass. Nevery has returned to the city of Wellmet after years in exile. He takes Conn home to be his servant (while Conn is under the impression that he is to be the wizard's apprentice, a prospect that he finds most appealing), and from there Conn is plunged into an intriguing new life. It appears the magic is being drained from Wellmet, and all the wizards are trying in vain to determine the cause. Conn has his own ideas, but who's going to listen to a former thief and pickpocket, particularly one who wants to be a wizard's apprentice but lacks his own focus stone? Conn's aptitude for magic is unmistakable, but without that stone he really might as well be nothing more than a servant. The story is told from Conn's point of view, and his lively descriptions of his new life and its challenges are extremely engaging. We also are told snippets from the wizard Nevery's diary that never fail to add a bit of humor, as they inform us of things such as Nevery's initial reluctance to bring Conn home, as well as his dismayed amazement at the amounts of food the boy is able to put away. I particularly liked the character of Bennet, the "muscle" that Nevery hires, who is great in a fight, makes amazing biscuits, and, when no action is to be found, sits around quietly knitting. The audio version of this book was very well done, and I will be waiting for the next one to come out on CD so I can listen to it as well. Greg Steinbruner is a wonderful storyteller, differentiating the voices of all the characters so that it seems as if they are different people speaking altogether. While the medieval setting is rather generic as far as fantasy novels go, the lively characterizations truly bring the story to life and, together with some interesting plot twists, make for a book that young fantasy readers are going to love. And older ones, too! If you'd like to do the "embero spell" yourself and discover what kind of animal you'll turn into, you can play here (I'm a cat - what about you?). 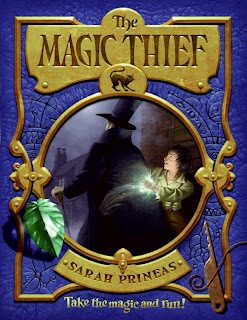 And here is an interview with Sarah Prineas. Enjoy! Charlotte's Library: "A great book for kids 9-12ish, or anyone that loves a brisk, crisp, magical story." Ms. Yingling Reads: "At first I was reluctant to read it, but it did have a certain charm, even if it was somewhat derivative of any number of medieval-ish fantasy books." Penmage: "This book is the real deal. An honest to goodness great adventure, a feel-good fantasy read that you won't be able to stop reading and will be sorry once the book is over. "